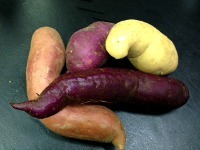 This site is all about sweet potatoes, also known as yams in the United States. All-About-Sweet-Potatoes.com gives you access to thousands of free easy recipes, nutritional data, facts, origin/history, and how to cook sweet potatoes. Try dishes from all over the world using - one of the most nutritious vegetables in the world. Use this site to learn how eating sweet potatoes can help you meet your health, beauty and wellness goals. You've come to the right place to learn about the sweet potato as a superfood. Check out the "Resources" page to know where to find heirloom and popular varieties. Worldwide sweet potato production and consumption is huge! Sweet potatoes have a major global impact. All around the world people eat and use this superfood, its plant leaves and roots. With a vast variety of uses, they are among the world's most important food crops. * Every year more than 130,000,000 tons are produced around the world. Production numbers are estimated for developing countries where reporting from rural farms can be inconsistent. Don't forget to bookmark this site. You'll want to come back again and again. Or, maybe you would like to share this site with your family and friends by linking to it. If so, just copy and paste the link below into your blog, a Web page, forums, a blog comment, your Facebook account, or anywhere that someone would find this site helpful. Or, see the "Pay it forward" link options at the very bottom of this page. Make this your #1 place in cyberspace for all about sweet potatoes! Go to Sweet Potato Recipes to find these dishes ... marshmallows sweet potatoes, crock pot sweet potato, candied sweet potato recipe, baked sweet potato recipe, sweet potato souffle recipe, Southern sweet potato pie, sweet potato cheesecake, sweet potato fries ... and many more.